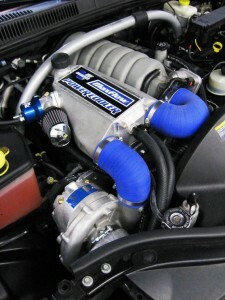 Complete Vortech supercharging systems for the 2006-2009 Jeep Grand Cherokee SRT8 are now available for order. Systems include the V-3 Si-Trim internally lubricated supercharger (no oil lines necessary), air/water dual pass charge cooler and complete fuel management – everything you need to bolt the system onto a stock vehicle. Results at the crankshaft are 560HP and 510 ft/lb Torque at a boost pressure of 7.5-8.5 PSI. For part numbers, pricing and system components click here. Complete systems include fuel management upgrades: high-capacity fuel injectors, 2 bar Map sensor, DiabloSport Predator® hand-held programmer and fuel pump voltage booster assembly. Tuner kits require the installer to provide custom tuning. A 1-year supercharger limited warranty is included with all systems. Complete systems may be purchased with an optional 3-year extended supercharger warranty. A 3-year/36,000-mile powertrain limited warranty is also available with complete systems if purchased and installed here!